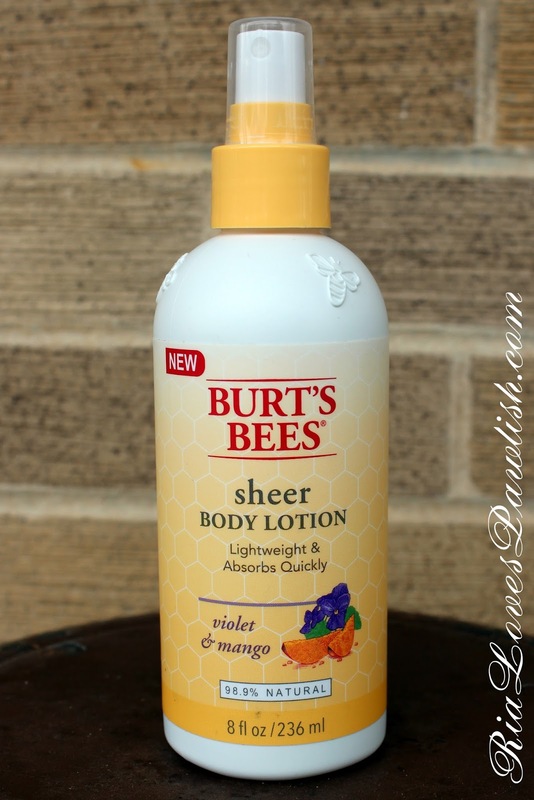 today i have Burt's Bees Sheer Body Lotion in Violet & Mango to share with you all! (it's a press sample, kindly provided to me for review). if you like natural products, lotion is 98.9% natural! it's a light body moisturizer that comes in a spray bottle, rather than the traditional tube or jar. it's so easy to use, and you don't have to go digging into a jar! i love the texture of it, it's thin enough to spray out through the nozzle, but not so runny that it goes everywhere. this lotion is definitely one that really absorbs into the skin, rather than leaving a fine layer on top, and it makes your skin feel SO silky. the scent isn't my favorite, but it's quite light and you don't smell it once it's absorbed unless you really sniff your hand :) Mama Pawlish is a huge fan of the scent and the lotion itself! if Voilet & Mango doesn't strike a cord with you, the Sheer Body Lotions also come in Cucumber & Aloe and Clementine & Calla Lily. here's a look at Violet & Mango! you can find Burt's Bees products on their website (www.BurtsBees.com) and in loads of stores all over the US... i saw the Sheer Body Lotions at both CVS and Target! on the Burt's Bees website, these lotions retail for $10.00.